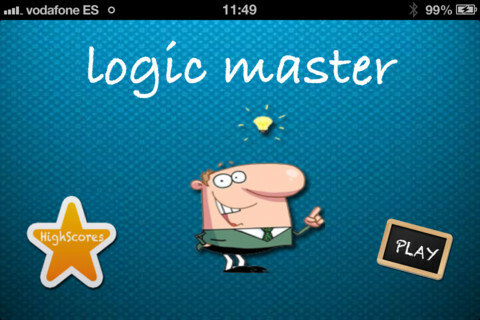 Logic Master is a puzzle game that will test your mental skills and intelligence based on different difficulty levels, based on classical logic games (surely you have played one in your childhood). It shows that, now that you've grown, you are able to solve all the problems in the shortest possible time from your iPhone, iPad or iPod Touch. Frogs: Frogs must pass from right to left and vice versa. Only if you can jump gaps between them. The sheep, the wolf and lettuce: you must transport the three animals from one side of the river to the other, with the addition that you can only carry one in each movement. Pay attention to which pair of animals leave in the river, because they can eat each other. Cannibals: you must transport a number of cannibals and explorers from one side of the river to another, given that the cannibals can not outnumber explorers. Torches: must get across the river through a trunk with characters limit above it and time limit. Despite the recent release of the game, the opinions of the users who have already downloaded to their devices are pretty good, although it should be noted that in the game require rate in the App Store ... It is best you to try and we too what you think. It's absolutely free for now.